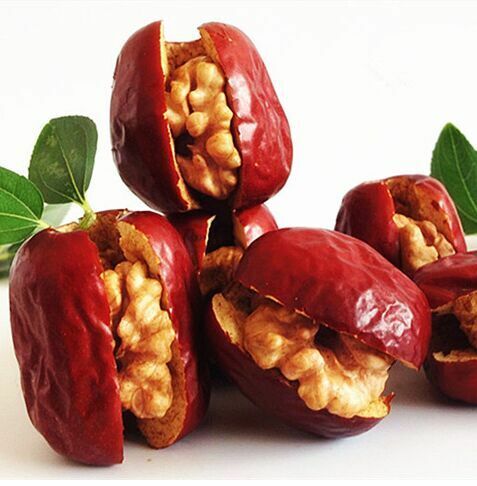 Product categories of Red Date With Walnut, we are specialized manufacturers from China, Red Date With Walnut, Red Date With Walnut Kernel suppliers/factory, wholesale high-quality products of Jujube With Walnut R & D and manufacturing, we have the perfect after-sales service and technical support. Look forward to your cooperation! The perfect match is red date and walnut inside. Chinese Red Date, origins Xinjiang of China, one of the best origins of date plant. Chewing soft outside and crisping inside, sweet outside and luscious inside. You will get multi-vitamin as well as energy that it is always needed during a day. The product is rich in CAMP, sugar, Vitamin C, Rutin. It can always be enrich the blood, and make people look great. Walnut is rich in protein, carbohydrate, calcium, phosphor, iron, microelement, and mineral substance. It is a great healthy food.